View at the recreational area of the neighbourhood. Illustration by Snøhetta, developer: Bybo AS. 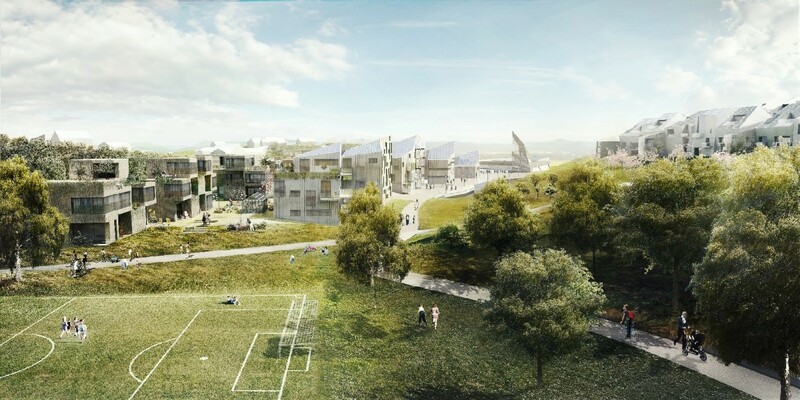 The Zero Village Bergen project encompass the development of a new neighbourhood on the outskirts of Bergen. The planning consists of approximately 720 dwellings (92 000 m2), divided between terraced houses (68% of total floor area) and apartment blocks (25%). 7% of the floor area is dedicated to non-residential purposes such as offices, shops and a kindergarten. In addition, a common parking garage using mainly wood as building material, is planned. The estimated time frame for the project is 10-20 years. The area is located 1.6 km south of Bergen an in proximity to the Flesland international airport (3 km) and the business area of Sandsli/Kokstad with about 15 000 workplaces. The closest centre is Blomsterdalen, a distance of 750 m. A forest and a lake, as well as, a residential area and a road surround the area. The planned development area is currently in use as a greenfield site with some semidetached houses on it. The closest public transportation hub is the light rail, 1.5 km to the north, but there is a bus stop on the site with buses approx. every 15 minutes. The main stakeholder in the ZVB project is the private project owner ByBo, a Bergen based developer that focuses on the development of low-energy and environmental-friendly buildings and neighbourhoods. Several private consultant agencies such as Norconsult, Multiconsult and Snøhetta and researchers from the ZEB Centre have been involved, as well as Bergen Municipality. The goal is to construct residential buildings within a neighbourhood with zero greenhouse gas emissions during the operation phase of the buildings on an annual basis (ZEB-O Standard, ref www.zeb.no). Minimize energy demand through the energy efficiency of the buildings. Development of an individual energy system based on solar cells and local thermal energy for each building. Stepwise development of the area in combination with a gradually rise of ambitions with regard to building standards (from ZEB-O÷EQ at an early stage to ZEB-COM, see www.zeb.no). Development of a transport infrastructure based on a broad network of walking and bicycle pathways, charging stations for electrical bikes, a car pool for electric cars and an electric bus that connects the neighbourhood to the nearby train station. Creation of an attractive public space which encourages an emission-friendly lifestyle: e.g. shared space, community gardens, a market place in a central position within the neighbourhood and playgrounds.